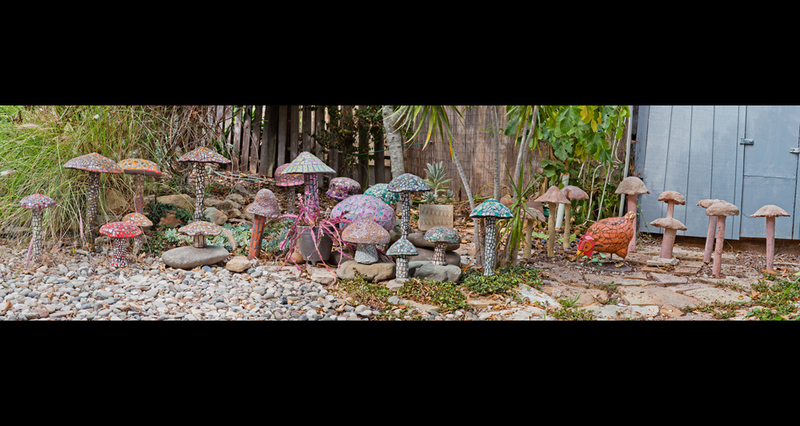 Garden Sculptures: Mushrooms and Fowl by Betsy Gallery in Santa Barbara, CA. For my garden I cast mushrooms in concrete using molds which I make and break with each piece so that no two sculptures are alike. Then the stems and tops are individually sculptured, adding more individual character. Some mushrooms I leave in raw concrete and others I cover with an assortment of materials, including 24 karat gold tesserae, dichroic glass and glazed ceramic. Some mushrooms have flat bottoms to sit on a surface. Others have a rebar stake allowing them to be "planted" in the garden. My barnyard creatures, a hen and a rooster, are formed on rebar armatures covered with wire mesh and concrete. The hen is of terra cotta and ceramic. The rooster has black Egyptain pottery and Chinese porcelain feathers. y garden art can be watered freely. I teach mosaic workshops at the Santa Barbara School of Mosaic Art.